(b) (i) State the meaning of the term volatile as applied to materials. 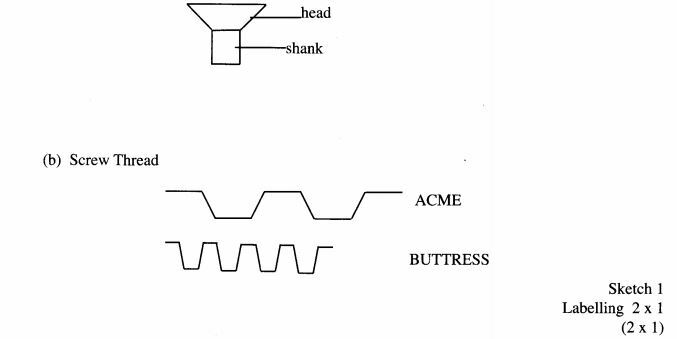 (b) Figure 1 shows two measurements A and B performed as an engine component. 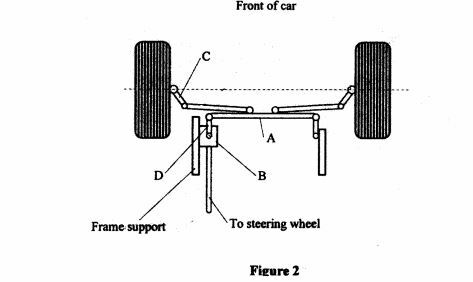 (b) Figure 2 shows a simpliﬁed drawing of a steering system. Answer question 11 and any other three questions from this section. Candidates are advised to spend not more than 25 minutes on question II. (b) Figure 4 shows the layout of a compression ignition engine fuel system. 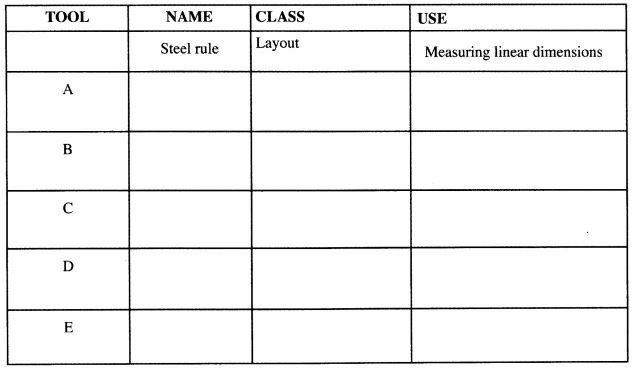 (c) Explain the three methods of checking minor chassis frame misalignment. 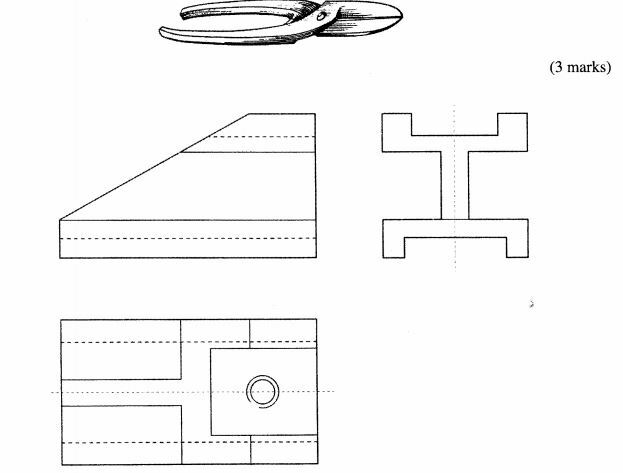 The ﬁgure below shows a truncated air cleaner assembly‘ On the drawing paper provided, sketch in good proportion the exploded view of the assembly and label four parts. 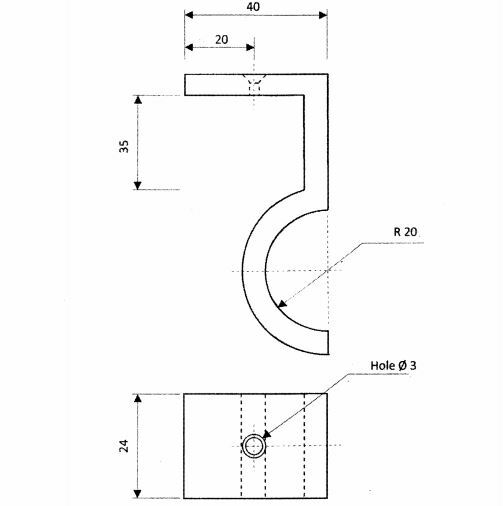 Using the tools, equipment and materials provided, make the support bracket as shown in the ﬁgure below. 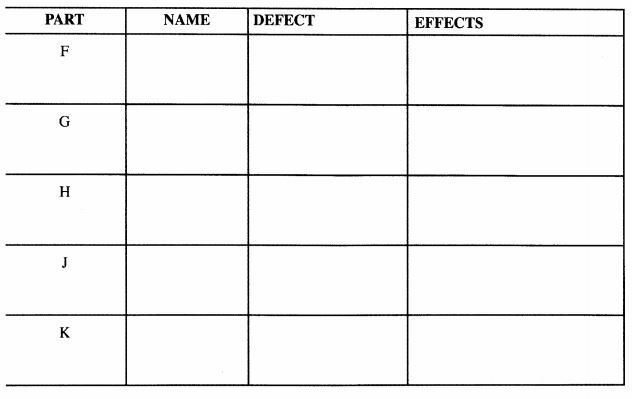 (b) Identify the defect at the section marked X and state one possible cause of the defect. (iv) Tread depth ..... ..
(i) Bore: Is the diameter of an engine cylinder. (ii) Throw: Is the distance between centreline of the crankshaft and the centreline of a crankpin. (i) Restores back into the battery the current used to start an engine. (ii) Handles the load of lights, ignition, radio and other circuits when engine is running. RELAY is a magnetic switch used in various electrical circuits. Flushing is the process of removing old/used ﬂuid from the system. As the engine crankshaft rotate, a low pressure (depression) is created in the chamber of the lift pump. This creates a pressure difference between the pump chamber and the tank, thereby causing fuel to be drawn into the lift via the course ﬁlter. The course ﬁlter removes large dirt particles from the fuel. As the crankesraft continues to rotate, the lift pump then applies a higher pressure to the fuel and forces it through the ﬁne ﬁlters to the galleries of the injector pump. The ﬁne ﬁlters remove any remaining ﬁne particles from the fuel because diesel requires to be extremely clean. The injector pump accurately meters the right amount of fuel to each injector nozzle and also pumps it at very high pressure at the end of each compression stroke, and in accordance with the ﬁring order. Each injector atomises the fuel and sprays it to the compressed air in each cylinder, thereby causing combustion to take place. Due to the very pressures in the system, some fuel always escapes back past the injector nozzles. This is collected by the leak-off pipes and is returned either to the tank to the intake side of the ﬁne ﬁlter. 13. (a) (i) Universal Joint compensates for change in drive shaft angle. 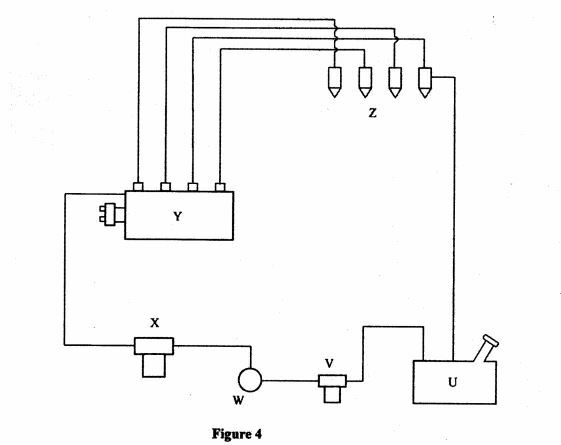 (b) Operation of Differential unit when cornering. When taking corners, the resistance on the rotation of the inner axle bevel gear increases as the wheels turn at different speeds. This causes the differential pinion gears to tum on their own axis and roll around the axle bevel gears. When this happens the inner wheel axle gear slows down. This causes the pinion gear to ‘walk’ around the slower turning axle bevel gear. This results in additional rotary motion being transmitted to the outer axle bevel gear causing the axle shaft to turn faster but still providing equal power to both wheels. In some cases one of the driving wheels can have little or no traction, the torque required to tum the wheel without traction being very low. The wheel with good traction is in effect holding the axle bevel gear on the that gear side stationery. Consequently, the differential pinion gears ‘walk’ around the stationary side axle bevel gear and drive the other wheel at twice the speed This the wheel with no tranction be essentially slipping. A whee] with no traction cannot deliver torque, hence, all the turning effort goes to the slipping wheel. To counter wheel slippage, non-slip differential or differential locks are used. (v) Springs, linkages and fasteners. 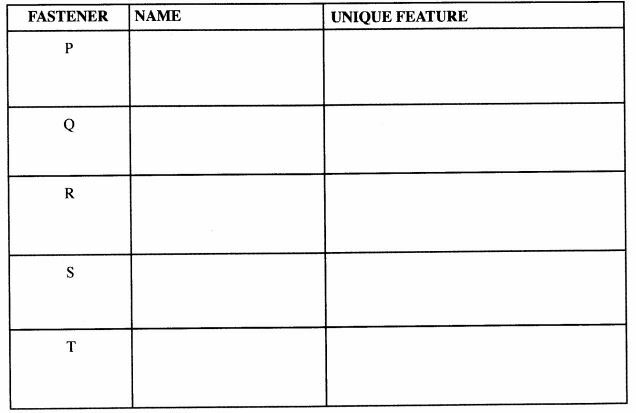 (i) Saloon (sedan) has closed body with four doors. (ii) Station wagon (estate) has extended roof to the rear and folding rear seat to create space for luggage. (iii) Coupe (sport) has closed body with two doors and lowered roof towards the back. (iv) Convertable (drop head) closed car that can be opened by removing or lowering the roof. - Drop plumbline from both sides of each shackle of the spring and mark on the ﬂoor with chalk for all the 8 points. - If frame is aligned, all the diagonals should across at the centre line.